For my birthday, my Aunt Jan was kind enough to send me a set of 3 vintage framed scenic silhouettes because she knew I'd always had a thing for silhouettes. Isn't she thoughtful? Well, in case she's reading, I hope she doesn't mind that I decided to make a temporary change to this trio! I was absolutely crazy for the combination of black and gold on the frame, but wanted to have a more modern/abstract look to the art inside and felt that a Robert Motherwell-inspired look was perfect. Robert Motherwell was an American painter and print maker who came into prominence during the middle of the 20th century during the abstract expressionist movement that included Jackson Pollack, Willem de Koonig, and Lee Krasner, among others. 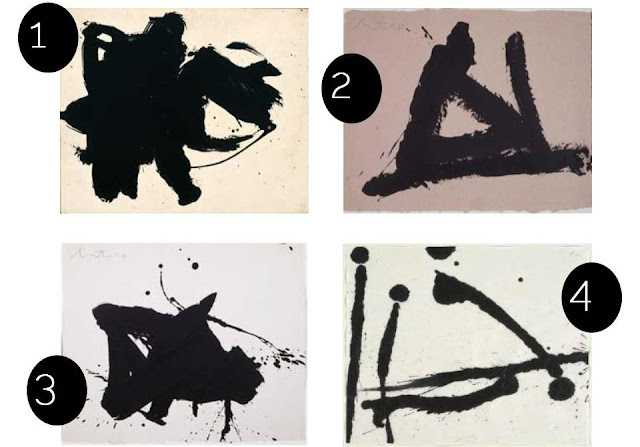 Motherwell's work attempted to communicate the "truths" found in the human unconscious. 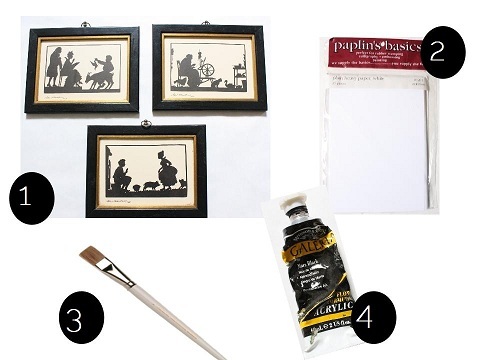 Want to see how I made 3 Robert Motherwell-inspired paintings with my gifted vintage frames? I started by removing the brown paper backing on each of the three framed prints, which then required me to remove about 78,000 rusty brads from each frame (good thing for that tetanus booster!). Next, all three frames and the glass were wiped down and I put them aside to begin painting lots and lots of abstract designs on my 3" x 5" white cardstock sheets with black paint. There was no rhyme or reason to the designs; instead, I held the paintbrush loosely and didn't think too much about the end product. I painted many extra sheets of cardstock so that I'd have many designs to choose from in the end. After allowing the paint to dry, I picked out 3 of my favorites for a coveted spot in the frames. I didn't mess around with those rusty brads again, and instead used masking tape to secure the paintings and backings in place. And, while I didn't show it, the silhouettes are directly behind the cardstock paintings, without any damage! And that's all it took to make these loose interpretations of Robert Motherwell's abstract expressionist style. Because I didn't ruin the original silhouette scenes, I can always swap the modern paintings out for them. What do you think of my Motherwell-inspired trio? Love your abstract creations in the great frames. I can't get enough of abstract art or gold these days either. I love these! I have been also doing a little painting of my own. I like them. I think the vintage ones are great too! So cool, I Love how they look in the black and gold frames too! Love Motherwell and love your DIY version. Look for Me in Today's Philadelphia Inquirer! What's Your Perfect Pillow Combination? Weekend Finds that I Just Had to Share!